Written on November 5, 2012 . Posted in Liberal Arts. 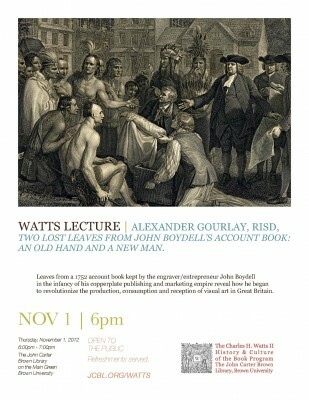 Alexander Gourlay (Professor, Literary Arts & Studies) presented “Two Lost Leaves from John Boydell’s Account Book: An Old Hand and a New Man” at the John Carter Brown Library on November 1. Gourlay discussed how leaves from a 1752 account book kept by the engraver/entrepreneur John Boydell in the infancy of his copperplate publishing and marketing empire reveal how he began to revolutionize the production, consumption and reception of visual art in Great Britain.